How many times have you heard someone say “People have the attention span of goldfish these days, about 9 seconds”? It seems plausible, but is it true all the time? It’s harder than ever to get people to focus on what we want them to. Does that mean that people aren’t reading blog posts or long form sales pages or watching videos that run longer than 2 minutes? How many of you have read a book or long form editorial in a media source in the past week? How many of you have been enticed to a YouTube video, seen it was 9 minutes or longer, but watched it anyway because the story or message was compelling, motivating, or just plain interesting to you? TEDx talks? Eighteen minutes on average. People read and watch what they find interesting; even those with goldfish tendencies. How do you make your writing worthy of more than 9 seconds of someone’s attention? Use all five senses when choosing words and ways to describe a better future, point out a pain point, write product descriptions, or craft a story. For instance, if you help women relieve stress, get specific on what kind. Are they anxious, harried, or breathless with all there is to do? Anxious and harried provoke feelings that stressed out might, but raises their emotion. As important as using colorful, emotional trigger words is eliminating fluffy words. In the interest of goldfish brain I’ll end this here. Less is usually more when it comes to making a point, and colorful words that engage all five senses can do the work of many more squishy ones. If you’ve never met the squid within, (that part of you that speaks and writes in squishy squid-like language,) but feel your pitches could use some help, you can download my free virtual, mini-workshop, Say It More Powerfully. It’s designed to help you answer the “what do you do” question, but if you do the exercises you’ll enhance your sales conversion, writing, and all forms of communication. Memes like the goldfish attention span can derail a great business from creating entertaining content or rich product descriptions because they believe no one will tune in. Why not create a swipe file of writing that engaged you? Read it looking for words and phrases that touched a nerve, poked at your emotions, or kept your eyes moving down the page. See if you can find fluffy words or phrases that don’t contribute also. 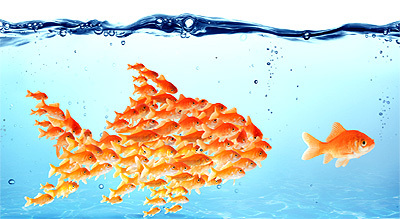 You’ll be writing more powerfully and engaging your ideal goldfish in no time. So helpful. You are so insightful and really inspiring. Thank you for the support. I’m looking forward to writing a better blog.